In Java 8, Java made two major changes in JDBC API. 1) The JDBC-ODBC Bridge has been removed. Oracle does not support the JDBC-ODBC Bridge. Oracle recommends that you use JDBC drivers provided by the vendor of your database instead of the JDBC-ODBC Bridge. 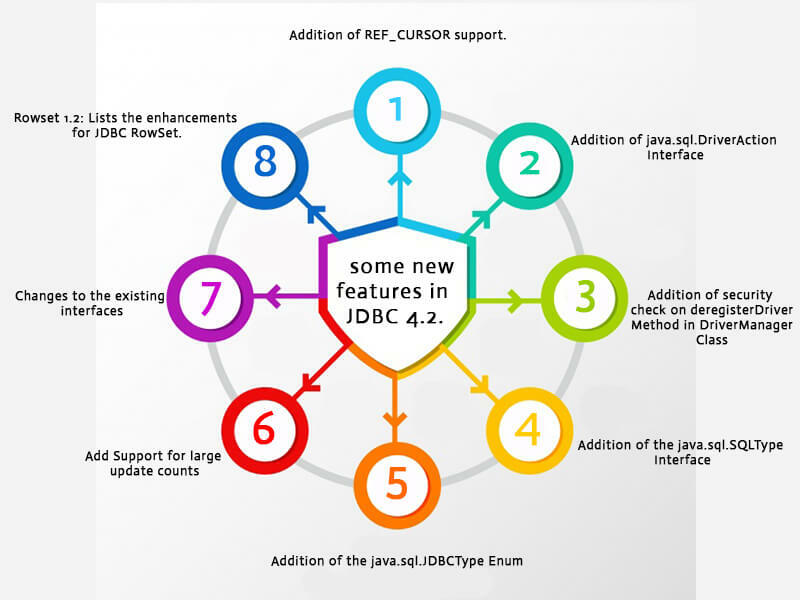 2) Added some new features in JDBC 4.2. It is an interface that must be implemented when a Driver wants to be notified by DriverManager. It is added in java.sql package and contains only one abstract method. void deregister() This method called by DriverManager.deregisterDriver(Driver) to notify the JDBC driver that it was de-registered. The deregister method is intended only to be used by JDBC Drivers and not by applications. JDBC drivers are recommended not to implement the DriverAction in a public class. If there are active connections to the database at the time that the deregister method is called, it is implementation specific as to whether the connections are closed or allowed to continue. Once this method is called, it is implementation specific as to whether the driver may limit the ability to create new connections to the database, invoke other Driver methods or throw a SQLException. This interface is used to identify a generic SQL type, JDBC type or a vendor specific data type. String getName() It returns the SQLType name that represents a SQL data type. String getVendor() It returns the name of the vendor that supports this data type. The value returned typically is the package name for this vendor. Integer getVendorTypeNumber() It returns the vendor specific type number for the data type. It is an Enumeration which defines the constants that are used to identify generic SQL types, called JDBC types. It extends java.lang.Enum and implements java.sql.SQLType. The following table contains constants defined in the JDBCType. public static final JDBCType ARRAY It identifies the generic SQL type ARRAY. public static final JDBCType BIGINT It identifies the generic SQL type BIGINT. public static final JDBCType BIT It identifies the generic SQL type BIT. public static final JDBCType BLOB It identifies the generic SQL type BLOB. public static final JDBCType BOOLEAN It identifies the generic SQL type BOOLEAN. public static final JDBCType CHAR It identifies the generic SQL type CHAR. public static final JDBCType CLOB It identifies the generic SQL type CLOB. public static final JDBCType DATALINK It identifies the generic SQL type DATALINK. public static final JDBCType DATE It identifies the generic SQL type DATE. public static final JDBCType DECIMAL It identifies the generic SQL type DECIMAL. public static final JDBCType DISTINCT It identifies the generic SQL type DISTINCT. public static final JDBCType DOUBLE It identifies the generic SQL type DOUBLE. public static final JDBCType FLOAT It identifies the generic SQL type FLOAT. public static final JDBCType INTEGER It identifies the generic SQL type INTEGER. public static final JDBCType JAVA_OBJECT It indicates that the SQL type is database-specific and gets mapped to a Java object that can be accessed via the methods getObject and setObject. Public static final JDBCType LONGNVARCHAR It identifies the generic SQL type LONGNVARCHAR. public static final JDBCType NCHAR It identifies the generic SQL type NCHAR. public static final JDBCType NCLOB It identifies the generic SQL type NCLOB. public static final JDBCType NULL It identifies the generic SQL value NULL. public static final JDBCType NUMERIC It identifies the generic SQL type NUMERIC. public static final JDBCType NVARCHAR It identifies the generic SQL type NVARCHAR. public static final JDBCType OTHER It indicates that the SQL type is database-specific and gets mapped to a Java object that can be accessed via the methods getObject and setObject. public static final JDBCType REAL It identifies the generic SQL type REAL.Identifies the generic SQL type VARCHAR. public static final JDBCType REF It identifies the generic SQL type REF. public static final JDBCType REF_CURSOR It identifies the generic SQL type REF_CURSOR. public static final JDBCType ROWID It identifies the SQL type ROWID. public static final JDBCType SMALLINT It identifies the generic SQL type SMALLINT. public static final JDBCType SQLXML It identifies the generic SQL type SQLXML. public static final JDBCType STRUCT It identifies the generic SQL type STRUCT. public static final JDBCType TIME It identifies the generic SQL type TIME. public static final JDBCType TIME_WITH_TIMEZONE It identifies the generic SQL type TIME_WITH_TIMEZONE. public static final JDBCType TIMESTAMP It identifies the generic SQL type TIMESTAMP. public static final JDBCType TIMESTAMP_WITH_TIMEZONE It identifies the generic SQL type TIMESTAMP_WITH_TIMEZONE. public static final JDBCType TINYINT It identifies the generic SQL type TINYINT. public static final JDBCType VARBINARY It identifies the generic SQL type VARBINARY. public static final JDBCType VARCHAR It identifies the generic SQL type VARCHAR. public String getName() It returns the SQLType name that represents a SQL data type. public String getVendor() It returns the name of the vendor that supports this data type. public Integer getVendorTypeNumber() It returns the vendor specific type number for the data type. public static JDBCType valueOf(int type) It returns the JDBCType that corresponds to the specified Types value. It throws IllegalArgumentException, if this enum type has no constant with the specified Types value. public static JDBCType valueOf(String name) It returns the enum constant of this type with the specified name. The string must match exactly an identifier used to declare an enum constant in this type. It throws IllegalArgumentException, if this enum type has no constant with the specified name. It throws NullPointerException, if the argument is null. public static JDBCType values() It returns an array containing the constants of this enum type, in the order they are declared. This method may be used to iterate over the constants.